These massive, recently formed stars inside N 81 are losing material at a high rate, sending out strong stellar winds and shock waves and hollowing out a cocoon within the surrounding nebula. The two most luminous stars, seen in the Hubble image as a very close pair near the center of N 81, emit copious ultraviolet radiation, causing the nebula to glow through fluorescence. Outside the hot, glowing gas is cooler material consisting of hydrogen molecules and dust. Normally this material is invisible, but some of it can be seen in silhouette against the nebular background, as long dust lanes and a small, dark, elliptical-shaped knot. It is believed that the young stars have formed from this cold matter through gravitational contraction. Few features can be seen in N 81 from ground-based telescopes, earning it the informal nick-name "The Blob." Astronomers were not sure if just one or a few hot stars were embedded in the cloud, or if it was a stellar nursery containing a large number of less massive stars. Hubble's high-resolution imaging shows the latter to be the case, revealing that numerous young, white-hot stars, easily visible in the color picture, are contained within N 81. This crucial information bears strongly on theories of star formation, and N 81 offers a singular opportunity for a close-up look at the turbulent conditions accompanying the birth of massive stars. The brightest stars in the cluster have a luminosity equal to 300,000 stars like our own Sun. Astronomers are especially keen to study star formation in the Small Magellanic Cloud, because its chemical composition is different from that of the Milky Way. All of the chemical elements, other than hydrogen and helium, have only about one-tenth the abundances seen in our own galaxy. The study of N81 thus provides an excellent template for studying the star formation that occurred long ago in very distant galaxies, before nuclear reactions inside stars had synthesized the elements heavier than helium. The Small Magellanic Cloud, named after the explorer Ferdinand Magellan, lies 200,000 light-years away, and is visible only from the Earth's southern hemisphere. 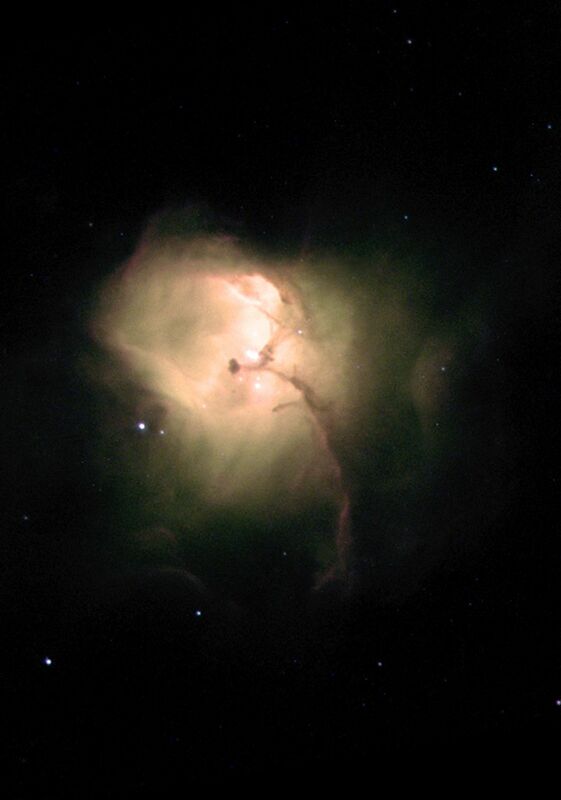 N 81 is the 81st nebula cataloged in a survey of the SMC carried out in the 1950's by astronomer Karl Henize, who later became an astronomer-astronaut who flew into space aboard NASA's space shuttle. The Hubble Heritage image of N 81 is a color representation of data taken in September, 1997, with Hubble's Wide Field Planetary Camera 2. Color filters were used to sample light emitted by oxygen ([O III]) and hydrogen (H-alpha, H-beta). N 81 is the target of investigations by European astronomers Mohammad Heydari-Malayeri from the Paris Observatory in France; Michael Rosa from the Space Telescope-European Coordinating Facility in Munich, Germany; Hans Zinnecker of the Astrophysical Institute in Potsdam, Germany; Lise Deharveng of Marseille Observatory, France; and Vassilis Charmadaris of Cornell University, USA (formerly at Paris Observatory). 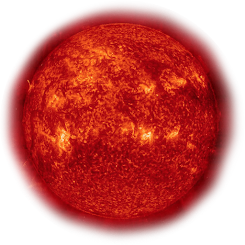 Members of this team are interested in understanding the formation of hot, massive stars, especially under conditions different from those in the Milky Way.